Brooklyn & Boyle | Art and Life in Boyle Heights : Aladdin Dual Language Edition Extended Through March 5th! Aladdin Dual Language Edition Extended Through March 5th! 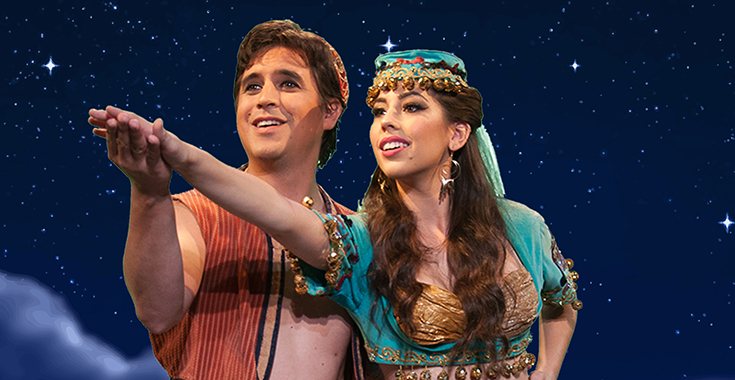 Michael Torrenueva as Aladddin and Sarah Kennedy as Princess Jasmine at Casa 0101. Photo by Luis Gaudi. Extended through March by popular demand, Aladdin: Dual Language Edition, one of several official adaptations of Disney's hit Broadway musical, has become the most successful musical theater production to ever debut on the Eastside of Los Angeles. Staged by TNH Productions in a co-presentation with venerable community playhouse Casa 0101, the play has wowed audiences from throughout greater Los Angeles since opening on January 13th and continues to attract sell-out crowds. In the play, the malevolent Grand Vizier Jafar, (Omar Mata) divides inhabitants of a city by using magic to make some speak in one tongue and others converse exclusively in another. In the role of Jafar, Mata alternates performances with Luís Marquez. While the dual casting was meant to give the lead actors time to rest as a result of a rigorous performance schedule (three shows a day, two days a week), it also exposes a greater pool of actors to the sound of two languages spoken simultaneously in the deft, code-switching manner many Europeans experience from an early age. Studies show that children who study and practice two languages or more and grow up in fluent code-switcher households score significantly higher on both IQ and aptitude tests. So, it is not beyond the scope of belief that Aladdin: DLE, beyond delivering a generous portion of spell-binding musical and theatrical entertainment, could very well be making both cast members and audience members alike, more intelligent. For the purposes of the glittering tale that unfolds on the Casa 0101 stage as a consequence of Jafar’s unkind and self-serving wish granted by a magic lamp, language reinforces the already rigid separation between royal palace residents and everyone else who inhabits Agrabah, the fictional city where the fable takes place. Jafar maintains his own ability to speak both English and Spanish while compelling, through the use of sorcery, all those who dwell in the palace to speak solely in Spanish. Those outside are similarly entranced and are thus only able to speak in English. Unsurprisingly, this magnifies Jafar’s power and control over state matters, making him even more important than the even Sultan, Agrabah's equivalent to a king. When Aladdin (Michael Torrenueva & Daniel Martinez) chances upon Princess Jasmine (Valeria Maldonado & Sarah Kennedy) during her expedition into the world beyond the palace walls to avoid an arranged marriage, he is unaware of her royal lineage because her true identity is disguised. Yet the pair feel something for one another immediately and turn to their mutual pets, Abu the monkey and Rajah the tiger, animals inadvertently endowed by Jafar with the ability to understand both tongues and speak human. Drafted as communicators, the two chatty mascots become comical translators and hilarious romantic intermediaries as a courtship between their respective masters ensues. Aided by a congenial Genie (Lewis Powel III & Finley Polynice) and a Magic Carpet (Danielle Espinoza), our intrepid and determined hero, a mere “street rat” in the eyes of Vizier Jafar, faces a series of challenges, language being just one of several, during his efforts to win the heart of the Sultan’s daughter. Encouraged and abetted by a colorful assortment of loyal friends from both in and out of the palace, their romance is at the heart of the most meaningful lesson conveyed by the story. The play suggests that everyone, no matter what language they speak or what cultural they have inherited, has something valuable to share with the world. Produced by Conrado Terrazas, Felipe Agredano, Abel Alvarado, Edward Padilla and Emmanuel Deleage, the presentation boasts musical direction by Caroline Benzon and choreography by Tania Possick. Led by Tejeda, executives at TNH Productions understood the gravity of their gamble when they agreed to pursue the rights to a production derived structurally from Aladdin JR., a previous theatrical version of the Disney film developed for the stage. 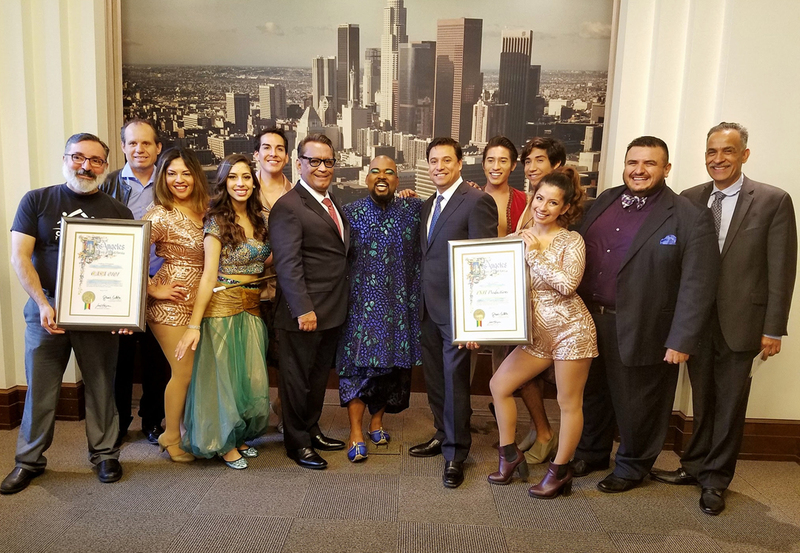 Aladdin producers and cast honored at City Hall by L.A. Councilmembers Gil Cedillo and José Huizar. Photo by Fredy Ceja. The latter, also adapted from the critically acclaimed Broadway production, was created for younger players as well as younger audiences with the Academy Award-winning score composed for the film by Alan Menken with lyrics by Howard Ashman and Tim Rice at its core. Aladdin JR., Disney Theatrical Group communications explain, features additional lyrics written by Jim Luigs, who adapted the book. The musical adaptation and arrangements for Aladdin JR. were contributed by Bryan Louiselle. The locally produced Dual Language Edition—directed with the admirable Tejeda flair even more Angelenos will now have the unprecedented opportunity to enjoy with the addition of 14 more scheduled performances—uses a book by Jim Luigs and José Cruz González with lyric translations by Walterio Pezqueira. Aladdin: DLE is distinguished, of course, by the plot modification which establishes the need for Spanish and English as an internal part of the storyline, namely, the introduction of Jafar, an undeniably villainous character whose disregard for those he considers beneath him is at the root of this welcome and timely production. The similarities between the character of Jafar and Donald Trump are uncanny, though producers had no idea their tender-hearted, love-conquers-all song and dance extravaganza would wind up mirroring real world occurrences to such a frightening degree. The production is presented through March 5th on the main stage at CASA 0101, 2102 East First Street (at St. Louis Street and 1st Street. directly across from the Hollenbeck Division Police Station), Boyle Heights, CA 90033. Peformances are: 8 p.m. Fridays; 2, 5 and 8 p.m. Saturdays; 1, 4 and 7 p.m. Sundays; through March 5th. Tickets are available online at www.casa0101.org or through the box office, which can be reached from 11 a.m to 6 p.m., Monday through Friday at (323) 263-7684.